While cooking your favorite meat on your Lang BBQ Smoker cooker, why not make some side dishes like grilled corn on the cob! Corn Fast and Hot! This recipe works well on both the smoker cooker and your grill. The trick to grilling corn is to keep the husks in tack to help hold in the moisture. Carefully separate and pull down the husks and remove the silk. Pull the husks back, smoothing them back into place. Moisten husks with water and roll tin-foil around each ear of corn. Place the ears on the edges of the grill (leaving the center to prepare the main course). 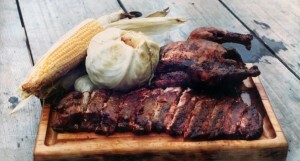 This entry was posted in Vegetables and tagged smoked corn recipe by . Bookmark the permalink.